The Pulitzer-Prize winning book Profiles In Courage, written by John F. Kennedy, speaks of historic leaders whose legacies are noted in history by their great sacrifices as a result of their courage. Reading the story of Daniel Webster, the Senator, former Constitutional lawyer and three-time Presidential candidate, particularly struck me this week as I also reconnected with a courageous leader whom I respect and admire. “Inconsistencies of opinion arising from changes of circumstances are often justifiable. But there is one sort of inconsistency that is culpable: it is the inconsistency between a man’s conviction and his vote, between his conscience and his conduct. No man shall ever charge me with an inconsistency of that kind”. Dear reader, I know what you may be thinking. What a dramatic leadership example! Webster was speaking during times when the topics were the preservation of the American union and the dissolution of slavery. How can those examples possibly apply to civic or business leadership? Together, let’s analyze the benefits of encouraging courageous leadership in our organizations. We are drawn to those who stand up for their ideals, and are memorialized in literature and popular culture. Through my research and personal leadership experience, I have come to believe that our efforts to encourage fellow principled leaders who are outspoken will lead to additional growth and success within our organizations. Let us view Maslow’s hierarchy with a focus on how the role of leadership can facilitate the potential in our organizations. This analysis can help us to better understand how we can support our teams and peers to better encourage critical thinking, courage, and overall fulfillment in our working environment. Our business environments facilitate our ability to provide food and shelter for ourselves and for our families. This can help us to establish security in our personal lives. If those basic needs are met, we can then move closer to the goal of achieving a sense of higher meaning and purpose. 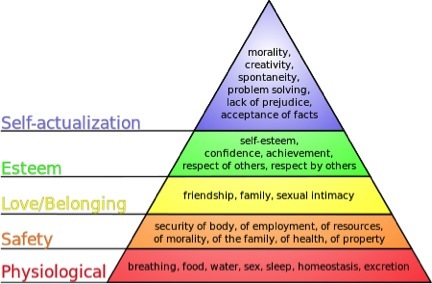 Only when supported and respected by others, Maslow asserts, can we ascend to the next levels of exploring, creating, and promoting our self-actualization. As leaders, we create a direction and vision in our team’s environment. In order to feel fulfilled when they are working, our teams seek the same needs outlined in Maslow’s pyramid – the same needs we strive for as individuals. We spend many hours of our lives in our organizational environments: is it any wonder that we strive for meaning and purpose when we are working? So where does courage fit in to this equation? As leaders, we should encourage our teams to be vulnerable and act with courage and integrity, despite the risks. This will help them to ascend their personal ladder of needs, ultimately leading to success of the larger organization through their innovation and higher-level thinking. Even the feedback that may be difficult to receive can ultimately create an organization of creative, open-minded, and confident employees. Challenge yourself to lead your teams by supporting more than their basic needs. I believe that you’ll find both personal fulfillment and encourage the growth of courageous leaders that can maintain and enhance the cycle of higher-purpose leadership. Ask yourself: are our needs hindered or helped by the leaders in our organizations? Do our leaders represent our valued leadership characteristics and support the needs of our teams? Carefully review the results. When you act with courage, your actions will not always be easy. As we’ve discussed, there can be great risk when confronting, challenging, and questioning. It is not uncommon that leaders do not exhibit the willingness to hear feedback and improve. Despite the risk, when used effectively, your voice can have a meaningful effect on those in your organization that may feel too timid or shy to speak. As I mentioned earlier in this post, this week I reconnected with a courageous leader that I hold in the highest of regard. While we were talking, I asked him about an incident when he put himself in harm’s way to raise awareness of an issue that was not favorably received by his organization. Back then; many thought his approach showcased the very essence of courageous leadership. Admittedly, I was also inspired by his willingness to sound the alarm in a move that could have been seen as antagonistic and destructive to his organization. I find that to be a valuable consideration for leaders seeking to find their courage. Be courageous but do so while balancing all appropriate variables. Courage is not the same as being reckless: speaking one’s truth is only as effective as the way in which the message is delivered. We pay for what we value, so make your peace with it – you will need to spend money! Only hire leaders that possess your desired leadership characteristics, as they will represent the interests of your organization. Commit to developing leaders by funding programs that support growing leadership competencies. Identify leaders that can support and help others. Look for leaders exhibiting characteristics of leadership, not solely those who have garnered attention and achieved public success. Look closely; your strongest, most courageous leaders may have been hiding in plain sight. Make leadership modeling and development a job review criteria. Bring in experts to help shape your initiatives. Although it has already been implied, I implore you to have “Leaders teaching Leaders”! Value courageous leadership and commit to it showing up in your culture. Program creation is not enough. Consider this final question. Should we hold our business leaders to the same standards of those who have found their place in history as transcendent and courageous, defying the thinking of a conventional approach? Those, who like Daniel Webster, stood up for their own ideals and values over all else – including personal gain? “Of course!” I firmly believe that we should accept nothing less than the highest qualities of leadership and courage in others and ourselves. Our standards for leadership should not change although the context and application may change relative to the situation. As leaders, we have a responsibility to our teams and peers to provide a rich and meaningful organizational structure. In return, we will receive personal fulfillment and the opportunity to grow the talent of others. As additional points of consideration: find strong organizations, partner with courageous, outspoken leaders and be bold. Know your values and stand up for them with a willingness to evolve and change as your worldview grows. With courage and the integrity, stand up for what you believe in and serve to create a meaningful organizational environment where creativity and innovation to flourish. I agree and often encounter situations where authenticity and courage can be compromised due to an organisational culture that promotes fear/control. To facilitate courageous leadership a climate must be created in a broader sense that promotes learning and trust. This requires the ‘pink elephants’ or norms that promote defensive behaviour to be cleared. Great points. If you have specific strategies behind correcting defensive and closed thinking, I would love to hear more about them. Feel free to email me directly. Thanks for your contribution.